The fight over a Bay Area girl's life and death is being revived in the campaign over a state-wide ballot initiative. The family of the Bay Area girl declared brain dead last year after surgery wants a judge to declare her "not dead,” but a PR strategist who used to work for the hospital says the family lawyer’s effort is a publicity stunt to boost a statewide proposition on next month’s ballot to let medical malpractice plaintiffs collect bigger payouts. Chris Dolan, the lawyer for the family of Jahi McMath, who was declared brain dead after tonsil surgery last year at the age of 13, has given $25,000 to the campaign for Prop. 46, a ballot measure that would boost the cap on verdicts from medical malpractice lawsuits from $250,000 to over $1 million. But Sam Singer, the publicist who used to work as a spokesman for the hospital that treated Jahi and is now speaking out against Dolan, also has a stake in that campaign. Singer is paid as a publicist to work for the "No on 46" campaign, aiming to keep malpractice caps at their current level. Singer noted the timing of Dolan’s legal request – about a month before the November elections. Secretary of State campaign finance records show the Dolan Law Firm gave $25,000 to the “Yes on Prop. 46, Your Neighbors for Patient Safety, a Coalition of Consumer Attorney’s and Patient Safety Advocates” in January. If Prop. 46 passes, the cap on medical negligence lawsuits will increase “for inflation” from when it was first passed in 1975. In today’s terms, that would amount to about $1.1 million. "This is no ruse,” Dolan said. “This is the truth." Dolan presented what he says are the findings of independent brain research experts who performed brain imaging and other tests on Jahi at Rutgers University Medical School. 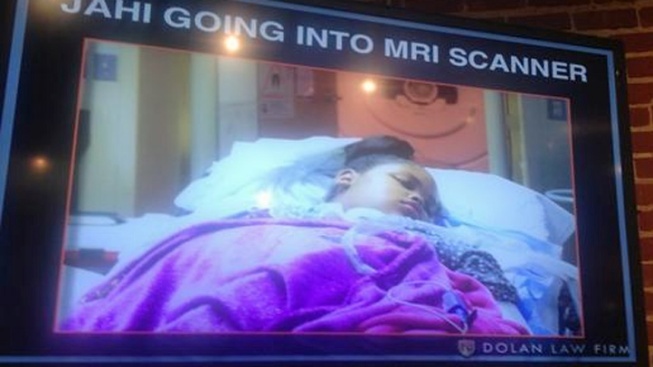 Jahi’s mother, Nailah Winkfield, said she finally has proof her daughter isn’t brain dead. She shared photos of the girl, appearing nourished and full of color, and videos that show Jahi apparently responding to commands to move her feet and hands. However, NBC Bay Area was not able to independently verify the videos. Jahi's family filed a court petition Friday, asking a judge to reverse the girl's death certificate. Dolan said Jahi has profound brain damage, but there is a difference between being brain damaged and brain dead. “This is unequivocal proof,” he said, pointing to an MRI photo. Dolan has not filed a lawsuit against UCSF Benioff Children’s Hospital Oakland, and has previously said that his fight for Jahi is not about money. He did indicate this week, however, to reporters that Jahi could be eligible for state benefits if her death status is changed. NBC Bay Area Legal Analyst Steven Clark said it would be very "unlikely" that a judge would rule that Jahi is now alive, but acknowledged it would be "fascinating." If Jahi were "resurrected," Clark said, that would force the state to pay for her care — even, perhaps, back at Children's Hospital in Oakland. "This is a huge economic issue," he said. This week, on behalf of Jahi’s mother, Latasha “Nailah” Winfield, Dolan filed a petition in Alameda County Superior Court for Judge Evelio Grillo to determine that the girl is “not brain dead,” even though the same judge had declared her dead on Dec. 24, 2013. Dolan’s experts have not been vetted by the judge, and it's unclear how Grillo will weigh their testimony. In his tentative ruling, however, Grillo said there are ways someone can amend a death record. But he felt that his court was not the right place to do so, suggesting that Dolan was not suing the right people and needed to find the proper agency to change Jahi's death status. As of Friday, Dolan had not filed a petition to amend Jahi’s death certificate with the California Dept. of Public Health Vital Records. And the Alameda County Coroner had also not been served with any papers.